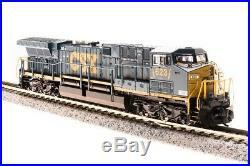 GE AC6000, CSX #606, YN3 Paint Scheme("Dark Future"), Paragon3 Sound/DC/DCC, N Scale-by Broadway Limited Imports. We've got a whole lot of new product coming, and we need shelf space. This item is new and unused, just needs to get off the shelf. A great time for you to take advantage of this bargain! Meet the winner of the horsepower race: the GE AC6000CW with 6000 hp under the hood - thats more than the Big Boys were able to do. They are about 76 ft. Long from coupler face to coupler face and are often run in pairs. On today's railroads, they are the king of the hill! BLI is producing these monsters from GEs Erie, PA plant and our models do them justice. Our new Paragon3 N Scale AC6000s more than do their life-sized prototypes justice. NEW Paragon3 Sound & Operation System FEATURING ROLLING THUNDERTM with Authentic Sounds and Prototypical Operation in both DC and DCC environments. Integral DCC Decoder with Back EMF for Industry Best Slow Speed Operation in DC and DCC. Precision Drive Mechanism engineered for continuous heavy load towing and smooth slow speed operation. Premium Caliber Painting with Authentic Paint Schemes. Prototypical Light Operation with Blue/White LED Headlight, Rear Light. ABS Body with Die Cast chassis for Maximum Tractive Effort. (2) Operating MicroTrains #1015 or Compatible Couplers. Separately Applied Handrails, Ladders, Whistle, and Brass Bell. Will Operate on Code 55, 70, 83 & 100 Rail. Recommended Minimum Radius: 9.75 inches. Operates in DC & DCC (use DCMaster for DC Sound). Record & Play Operation - Records and plays back sounds and movements once or repeatedly for automatic operation. 16-bit Sample Rate for exceptional high frequency sound clarity. Alternate Whistle / Horn where applicable for locomotive with air horn and steam whistle - both the main whistle and alternate can be easily played. Adjustable bell ringing interval for faster or slower bell. Numerous user-mappable functions with available keys. Passenger Station Ambient Sounds - Controlled with Function Key. Lumber Yard Ambient Sounds - Controlled with Function Key. Farm related radio chatter - Controlled with Function Key. Crew Radio Communications - Controlled with Function Key. Maintenance Yard related radio chatter - Controlled with Function Key. Demo Mode for display and demonstrations. Simple Programming with Integral DCC Decoder. Individually adjustable sound volumes for most effects. The item "Broadway Limited 3426 N GE AC6000 CSX #606 YN3 Dark Future Paragon3 Sound/DC/DCC" is in sale since Friday, August 17, 2018. This item is in the category "Toys & Hobbies\Model Railroads & Trains\N Scale\Locomotives". The seller is "les483" and is located in Indianapolis, Indiana. This item can be shipped to United States, Canada.